Baby Isuzu NPS fire truck. 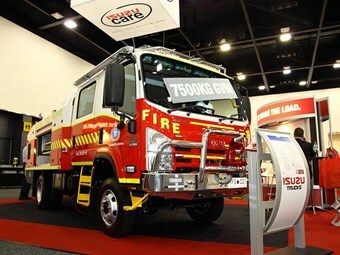 Isuzu’s off-road engine range has seen an expansion in the form of a new fire-fighting pump for Australian fire trucks. Prominent fire pump manufacturer GAAM has launched their new MK300 water pump powered by the Isuzu 4LE2 engine. The four litre water cooled 4LE2 is a totally different machine to similar-sized truck engines, designed for a totally different job, pushing out just 52hp (38kW) and 143Nm of torque. The Isuzu-powered GAAM pump was on display at last week’s 2015 Australasian Fire and Emergency Services Authorities Council (AFAC) conference and exhibition in Adelaide. "A number of new products featuring Isuzu’s off-road engine range were launched during the event," says Dean Whitford, Isuzu Australia’s manager – industrial and marine engines. "We’ve been working extremely hard to develop the quietest, most compact engine we can, and AFAC15 has been proof that our ongoing refinements are being welcomed by the industry." Isuzu Trucks also showcased an extensive range of emergency services-specific 4x4 models including an NPS 65-155 4X4 Crew, featuring the brand new compressed air foam (CAF) system. The NPS, belonging to the Tasmania Fire Service, is the first of its kind to feature such as system, making it unique to the Isuzu platform at 7.5 tonne GVM (gross vehicle mass).